Hockey Blog In Canada: Just One Spot? 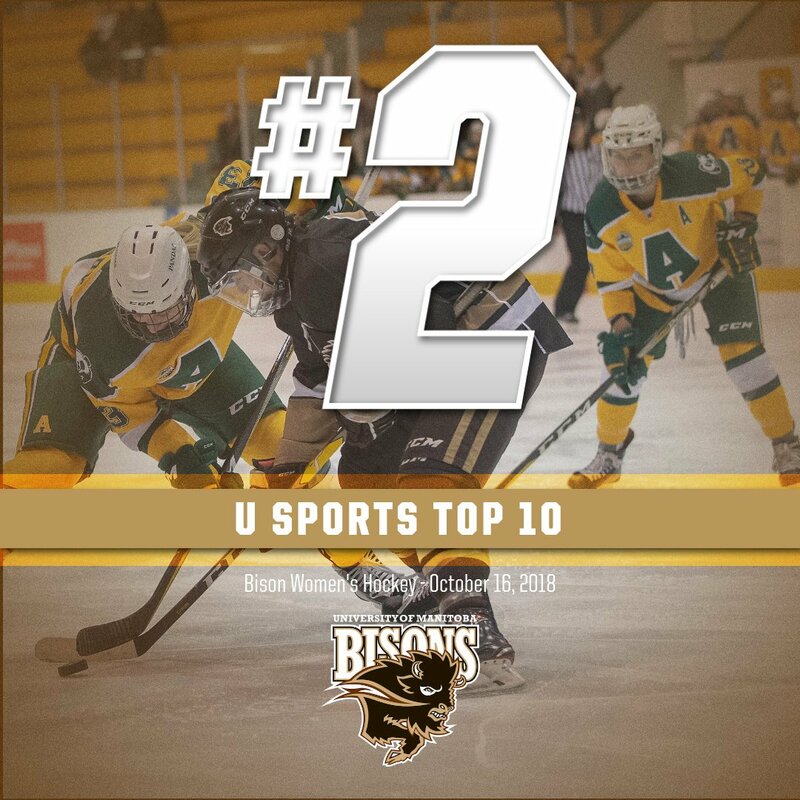 The U SPORTS Top Ten lists came out today, and there was some apprehension from this writer after the University of Manitoba women's hockey team were shutout twice last weekend by the Alberta Pandas. While I should probably temper my worry a little since the Bisons were 2-2-0-0 last season at the point, the fact remains that they also weren't the top-ranked team in the nation at that point. In any case, I expected some serious movement from Alberta after they played some rather outstanding hockey compared to the top-ranked Bisons in their two meetings this past weekend, and we got that very movement as the voters cast their ballots. Or the mathematical equation that apparently still isn't in place. So back to the voters we go. 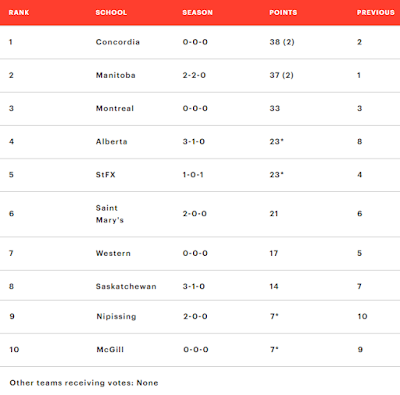 So Concordia, who has yet to play a game in the RSEQ after finishing with the bronze medal last season, moves into the top spot in the nation while Manitoba, who dropped two-straight games to Alberta, falls to second-place. Montreal doesn't move despite not having played a game, Alberta jumps up four spots after their impressive showings against Manitoba and Saskatchewan to start the season 3-1-0, and StFX drops a spot despite losing a game to unranked Dalhousie in the shootout to round out the top-five spots. I seriously don't understand how the voters work. Manitoba, in my view, should have fallen more than one spot after being shutout twice by a team who now has a better record and certainly has had a more difficult schedule to start the season in Alberta. Saskatchewan, who played Alberta to a split before sweeping Calgary with a regulation win and an overtime win, should legitimately be closer to both Alberta and Manitoba as well, and I certainly struggle in seeing three RSEQ teams in the Top Ten when none have played a single second of the regular season yet. 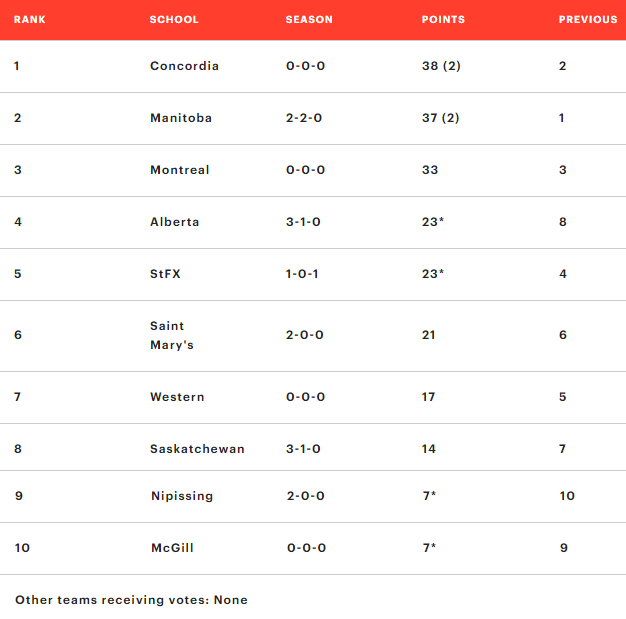 If this were preseason rankings, I can handle seeing a couple of RSEQ teams in the Top Ten, but shouldn't teams have to earn a ranking by actually playing games? Am I misunderstanding how the voting works? I don't care about strength of schedule because none of the teams cross over into each other's schedule, so shouldn't results against Top Ten teams weigh more heavily on who is better than whom? It might be a good idea to enable that complicated calculus equation found in the Elo Rating System sooner rather than later to determine the Top Ten because I feel that there is still a pile of voter bias that is going into the system right now. I get that Manitoba may still be rounding into form like they did last season when they kicked it into another gear in January for the second-half of the season, but that's why they shouldn't get the benefit of the doubt until they do. For Saskatchewan Huskies fans, I got your back on this one. You guys are better than eighth-place in the country right now. And as much as I want to be the homer, Manitoba probably shouldn't be the second-best team in the country at this point in the season.